I got a car-a-mel ap-ple. Huhana, four – without ever touching a caramel apple. A lot of people have written about their experiences giving up alcohol and how much better their life has been since. I don’t think I’ve done that, and this isn’t one of those. This is a letter reminding you that just because everybody else does something, that doesn’t mean you should too. And just because you’ve always done something, you don’t have to keep doing it. I’m sure all the other adults in your life will say that or something similar, many times over. But this isn’t me telling you off, it’s me sharing what I can see now with some distance – I’d made drinking a habit. Habits are things that happen without you noticing. I never noticed I wasn’t in control of my relationship with alcohol, until I got it back. As smart as some individual humans are, as a species and a society, we still do a bunch of really, really stupid things – often just because we’ve always done it. We evolved in tribal society, so we’re hard-wired to conform, to act like everyone else, to make our iwi accept us. We needed to fit in so we could share in the kahawai catch when the waka pītau returned. We wanted to belong to a group so we were protected on the predator-filled plains. Outcastes were physically excluded from shared kai and warmth. We followed the herd to stay safe – literally and now figuratively. We adopt the mentality of those around us. We think we need to buy alcohol and get drunk to relax or hang out with friends, because that’s what everyone else does. But you don’t live on the plains. You can fish in a one-seater kayak. You know how to think on your own. And, thanks to the internet, your potential tribe is huge. Everyone drinks, so everyone drinks. I’m not talking here about the people who can’t stop drinking without help, their challenges are different. I’m also not talking about the extreme introverts who actually need a beer to loosen up enough to talk to other people. Huhana it might be too early to tell at four, but I don’t think that’s who you are. Kāhu, you’re happy enough making noises that sound like words at the moment, so we’ll have to wait and see. The World Health Organisation report says alcohol is responsible for 1 in 20 global deaths. Considering the amount of disease in third world countries – that’s a big number. And New Zealanders drink more than most. In 2016, alcohol cost NZ society $5 billion. FIVE BILLION DOLLARS. But it’s sale only contributed $960 million in tax. So the money put back into society to pay for the schools you’ll play at, the hospitals where your first broken arm will be mended, covered about a fifth of the cost its sales created. In the same year, 52 people, or groups of people, were either driven home or held by police because of intoxication, every single day. If you think of us as a society or tribe of New Zealanders, it’s like we drink, do something stupid, wake up and start drinking again. In Aotearoa, we voluntarily make drinking a weekly, sometimes daily part of our lives and culture, knowing that it kills us, and knowing that it costs our society the equivalent of 72,500 senior teachers’ salaries, every year. If us adults all stopped and thought about it, I’m probably not the only one who drinks just because everyone else does. The adults around you, the ones charged with showing you what’s good for you, and what’s not, know that stuff. None of it is a secret. But in NZ, we still spend about $85 million every week, buying wine, beer and spirits. We still sit in a circle and drink and laugh and fight and pass out. We really are still just cave-people who learned chemistry and marketing. Māori are approximately twice as likely as non-Māori to have alcohol use disorders – that’s you. It’s a Class 1 carcinogen. So the link between alcohol and cancer is similar to that of asbestos, arsenic, and tobacco smoke. Us adults already know all this. But as a species, a society, and a community – we keep doing it. Just like we keep doing a bunch of other stupid things that kills us just as quickly, and cost us just as much. Then we laugh at the idea of Lemmings following each other off the cliff to their death. Stupid animals. If you’re working by the time you read this, I wonder if Friday work drinks are still normal. I wonder if not drinking is still not. If people still ask with a frown, ‘Oh, you’re not drinking?’ – based on how harmful we know it is, shouldn’t the surprise be the other way around? Once I stopped drinking, I realised I did have a problem. The problem was, while I thought I was making the decision to drink, it was actually being made for me. Drinking had become a habit. Had a hard day at work? Have a beer like you always do. Wanna spend some time with mates? Let’s get’s on the piss – that’s what we do when we’re hanging out. Don’t be a weirdo. Drink. Through the habit, I’d created a reality where I needed to dull my senses with a beer or three, just to relax or to have fun with my friends. Everyone here is drinking, that doesn’t mean I have to. I said this letter wasn’t really about alcohol, and it’s not. I’m not telling you to not drink alcohol. That’s not my decision to make and I’m sure there’s a lot you’d miss out on as teenagers if you did. What I am telling you is, don’t be a lemming. Think for yourself. Realise the difference between a decision made for you, and a decision made by you. Think twice about what everyone else thinks is right. Don’t forget that for the most part, humans as a society are stupid, alcohol is far from the only example. So doing something just because everyone else does, is like following the biggest concentration of dumb. Have a look through history and remember all of the stupid things we did: burning women at the stake because corn wouldn’t grow, sacrificing people until it rained – the list goes on – every one of those things was perfectly normal at the time. We did it because we’d always done it. Everyone else thought it was fine, so we did too. Think for yourself and be prepared to be different. Your friends aren’t your friends because you do the things they do. They’re your friends because of who you are. You don’t expect your mates to be exactly the same as yourself, neither do they. Strength of character is being able to say: ‘Nah, I don’t do that, but I’m cool.’ That’s what standing on your own two feet sounds like. You’re more than what the people around you do. Be you, be staunchly you, be prepared to be different without thinking it means you have to sit outside the circle. 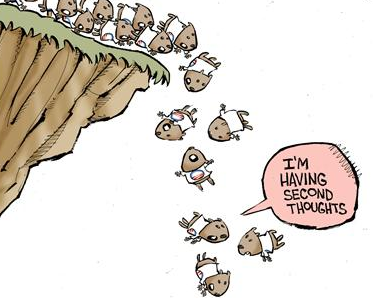 Don’t be a lemming. Be you. I don’t write these letters very often, but sign up and I’ll let you know when I do. Porirua, Ōtaki deaths: Authorities slammed for lack of response A mental health expert is calling health authorities’ response woeful as Porirua and Ōtaki grapple with a spate of sudden deaths.